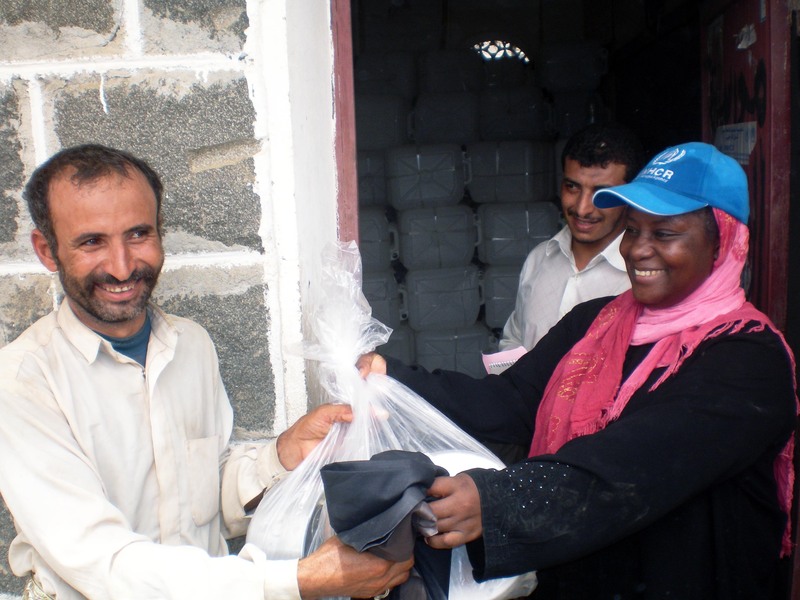 Martha Kow-Donkor (Liberia), is enthusiastic about her assignment to help internally displaced persons in Yemen by managing refugee camp and emergency shelter coordination as well as non-food item distribution. Amran, Yemen: When I was selected to serve as a UNV volunteer Associate Field Officer with the United Nations High Commissioner for Refugees in Yemen in June 2008, I was very anxious but filled with enthusiasm of working in a different social and cultural context as compared to Liberia, my country of origin. In Liberia, I worked with different international NGOs as well as UNHCR where the concept of UN volunteerism was well-known. There were national and international volunteers working with UNHCR, other UN agencies and the UN Peacekeeping Mission in Liberia. Listening and participating in UNV programmes enforced my interest in volunteerism. I am encouraged by the core idea that volunteering makes important economic and social contributions, including towards a more cohesive society by building trust and reciprocity among citizens. It can be both challenging and rewarding and requires that you transfer your skills to a new context. Over all, volunteering is a free choice. Yemen is a country faced with many challenges, including internal conflicts, piracy, terrorism and extreme poverty. Recent conflict in the north resulted in the massive displacement of the population, loss of lives and livelihoods as well as mass destruction of homes and infrastructure. Humanitarian access to the affected population is at times limited due to the presence of armed groups, illegal tribal checkpoints, landmines and other unexploded weapons. My first assignment in Yemen was to manage the UNHCR Field Office in Saada, in northern Yemen for six months, overseeing the Internally Displaced Persons (IDP) operation. The work was enjoyable but challenging in terms of access to reach those in real need. I learned about and experienced a different culture and enjoyed working with my Yemeni colleagues as well as interacting with humanitarian workers from different agencies, nations and backgrounds. As the conflict deteriorated, movement within Saada became more and more restricted due to security concerns. In order to continue delivering protection and assistance to the internally displaced persons, we established a remote management mechanism through local NGOs. My second assignment was in Amran, Yemens northern region that was affected by the conflict and displacement with a challenge of influential tribalism. The main task of the team I was part of was to ensure overall protection and safe access for IDPs to basic services including safety, water, food, health care and shelter, amongst others. Many were the challenges we had to face daily to achieve our goals, including illegal tribal checkpoints, hijacking of relief convoys and unwillingness by some host communities to accommodate IDPs. Despite all these situations, we were able to assist those people in need and work with communities through joint efforts with other partners and community participation. Due to my familiarity with the IDP operation in Yemen, coupled with my leadership skills, recently I was assigned to coordinate the Camp Coordination Management/Emergency Shelter/Non-Food Item Cluster in Yemen. This work involves ensuring that there are no gaps in the overall humanitarian response to IDPs in the two sectors, including through a collaborative leadership approach. In general, I am very enthusiastic about my work as a volunteer. It is a priceless chance to learn from others and share experiences both as volunteers and part of the UNHCR family. Being a volunteer helped to enhance my skills and has given me the courage to continue to volunteer and endure any challenges and difficulties that I may encounter. I was given the chance to develop as a professional, including through various trainings such as Camp Coordination Management and Emergency Shelter Coordination. Further, I have acquired basic skills in the Arabic language, which I never dreamed of learning, given my main interest in learning French. On a final note, I would like to applaud all those volunteers who continue working towards a positive change in the lives of people and their communities. I want to also encourage all professional humanitarian and development workers to volunteer once in their lifetime. As a UN volunteer you have the extraordinary opportunity to create beneficial change and have a positive impact on people's lives. Even if your UNV assignment is fairly short, it can have a long-term impact and achieve a ripple effect that extends far beyond the immediate beneficiaries of your efforts.